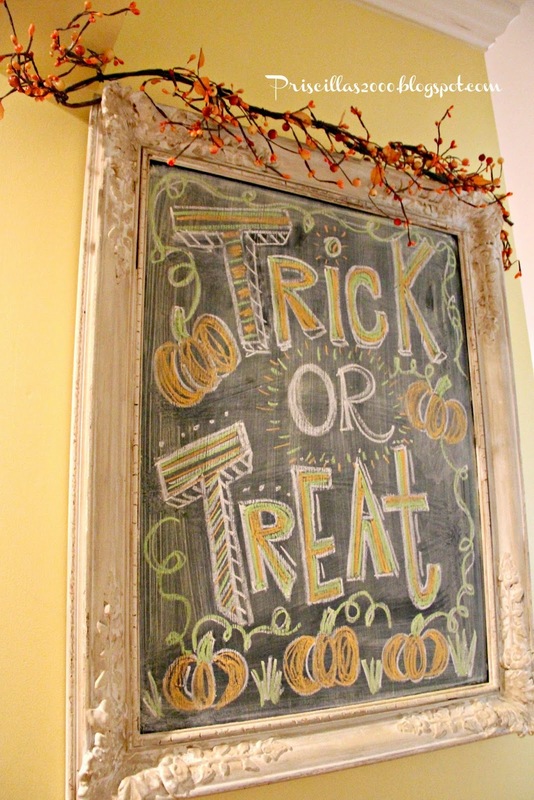 It's time for a new chalkboard for the month of October ! I used the colored chalk again and just doodled until I got it the way I wanted it to look.. 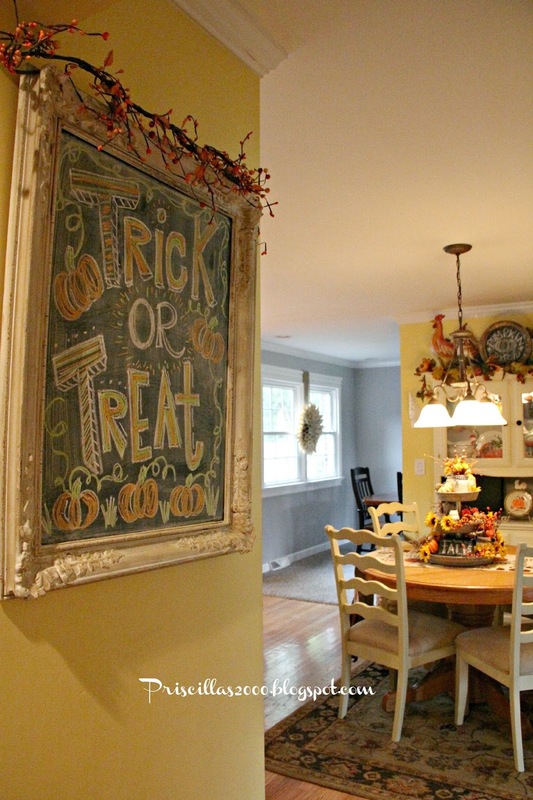 This chalkboard that hangs between the kitchen and family room is such a great way to decorate for the seasons.. 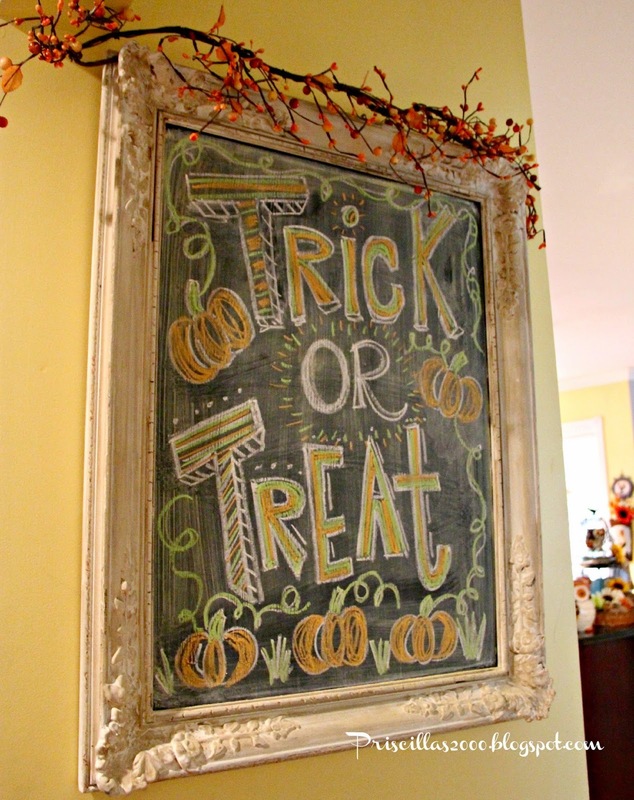 I got the frame at a yard sale and had a board cut to fit at Home Depot , and painted the board with chalkboard paint. It has been hanging up for a year now ,and I love changing the designs ! I still need to put out the Halloween decorations .. hopefully today ! Yesterday this cute guy and I went apple picking .. He loved eating th apples ..not so much picking :) We got two big bags of Golden Delicious .. Can't wait to make some good things with them ! 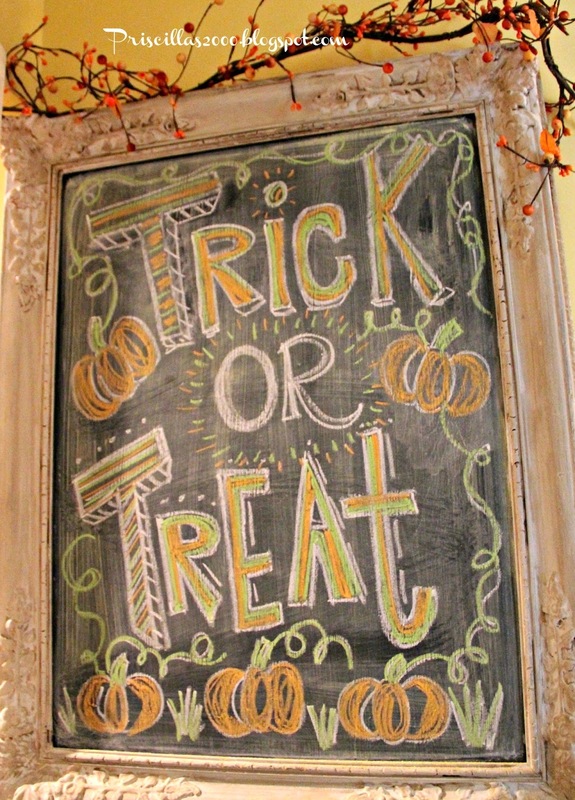 I love your October chalkboard message! I have one in my kitchen too, and I like to do little messages on it. I actually moved it to the laundry room recently and I don't seem to write on it as much in there. I may have to move it back. Just you and the little one went apple picking? How fun. He is so darn cute!!!! Whatcha making??? Love your sweet grandson with his apple--have fun baking! Your October chalkboard is great but the little apple picker is even cuter! 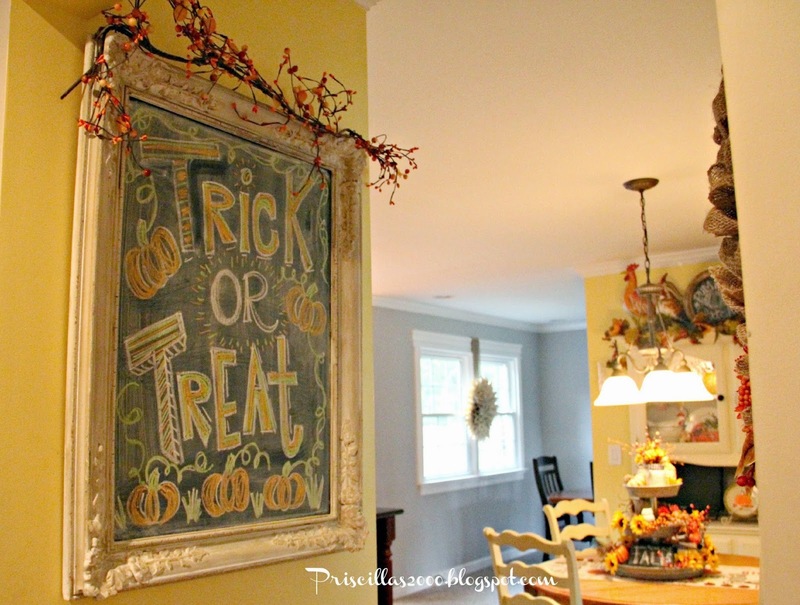 Love your trick or treat chalkboard and all the fall touches you have added to your home. Gorgeous! I agree with Carol, Priscilla. My lettering wouldn't look as nice as yours does.. Maybe I could get my daughter to do one for me. Your little apple picking buddy sure is cute.. I know he was a joy to have with you.. Enjoy your weekend.. I'm interested to see your Halloween decorations.. Halloween is so much fun. That is so great!! Have a great Sunday. So cute!! I need to do this in my kitchen, Thanks! This is so cute! 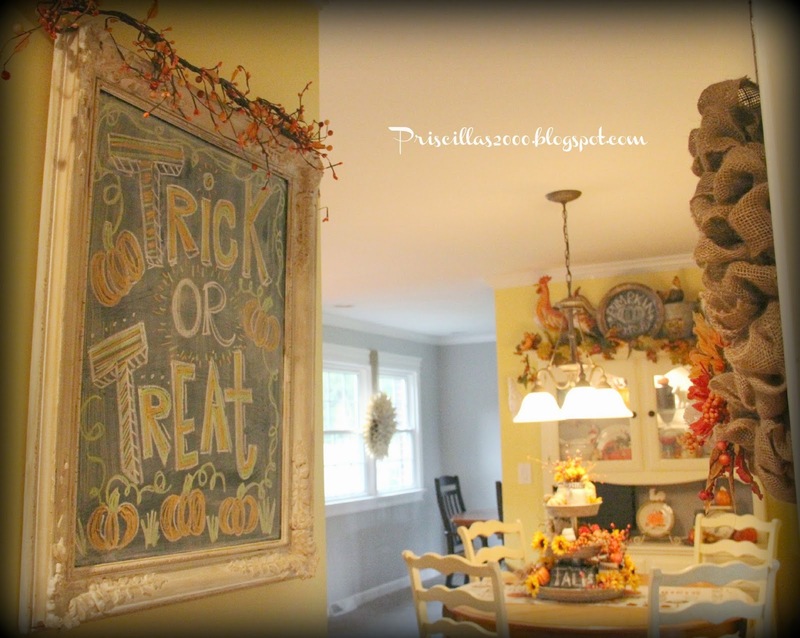 I am going to have to try this with my chalk board! I would love it if you would share a project on my Meet Up Monday Blog Party! 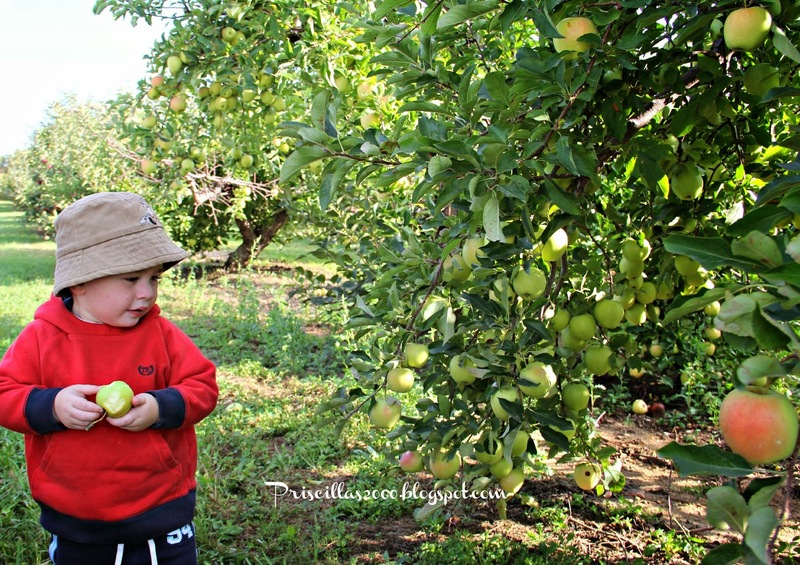 Your little apple picker is as cute as can be and so is your chalkboard. I have almost stopped drawing on mine because I just can't get it to look like all those beautiful chalkboards that I see around! I really like the chalkboard. I love that you can change the message to match the season, or special occasion. Great job!